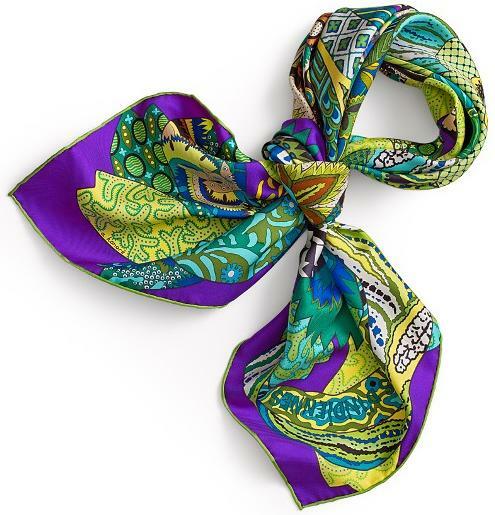 I fell in love with this scarf since the moment it was launched, and I'm surprised as to how I managed not to give it a place of honour in the list of beautiful scarves. "Jardins de la Nouvelle Angleterre" ("Gardens of New England") lets you admire, as if through a lens, the beauty that the pictures landscapes display. 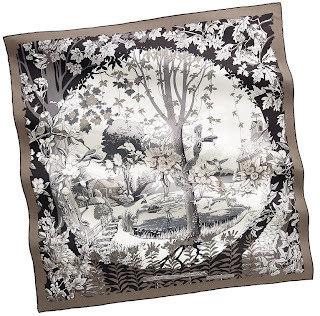 Looking at this landscape depicted on the scarf, I have the distinct impression I'm coming out of an expedition through the forest to an opening where life is idyllic - trees, plants, racoons, a river stream ... rich fauna and flora that coexist harmoniously with the human inhabitants. The scarf ties wonderfully and the colour combinations (the red, depicted above, the forest green and the taupe, below) are absolutely phenomenal ! Only a few riding schools around the world have managed to preserve the equestrian art intact over the centuries and cultivate people's admiration for the horse. Since the development of engines and the introduction of cars, horses have no longer been playing as critical a role in people's lives. The horse's nobility, beauty and role it played in human history have nevertheless earned it a tremendous respect of the animal. "Grand Manège" ("Great Riding School") thus pays tribute to the invisible training necessary for a flawless spectacle. Some bits of harness from the Cadre Noir, the prestigious French riding school, have inspired this composition: the ribbons knotted with rosettes to be plaited into the mane of the steed, the cockades to adorn its ears, but also reins and bridle in leather, stirrups with round stirrup pads… These elements have been arranged so as to mirror the "arabesque" figures one can expect to admire during show horses. As Hermes so eloquently describes it, the equestrian art is born of a mysterious intermingling of effort and humility, of patience and beauty. This scarf was first launched in 1990, and reissued several times since then (in 1991, 1993, 1997 and this year in regular size, pleated and as Twilly). 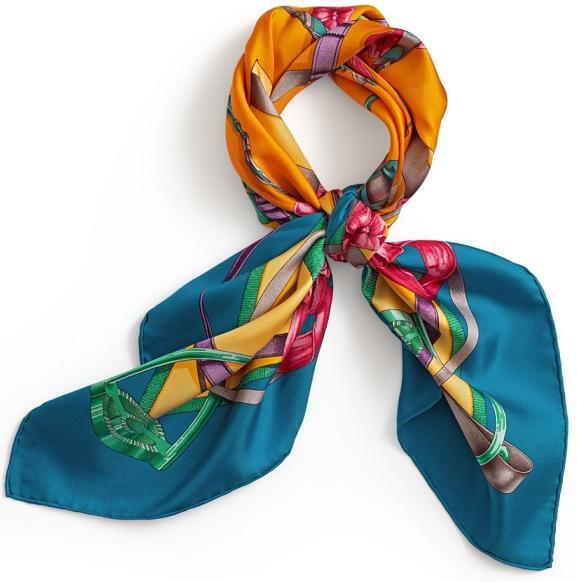 Some colour combinations appear to reflect a younger spirit than others thanks to the presence of several brighter colours that infuse a certain playfulness into the scarf - either way, the actual design is certainly quite traditional so it, alone, would not be sufficient to render the scarf more contemporary. An exciting tribute to the craftsmen from India who have enchanted us with their prints at least since the 16th century, when Indian-made fabrics first entered France not only mesmerizing the fashion-sensible population, but also threatening the domestic manufactures. 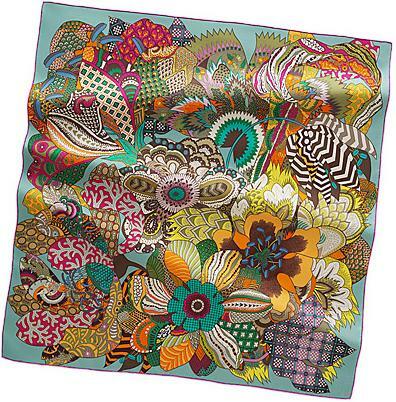 Aline Honoré, the creator of this design, has explored this beguiling theme before, choosing to focus her attention (and ours) on fabric samples proper in 2008's "coupons indiens" and in 2010's "pelages et camouflages" and "cents plis de miao". In addition, she laid the design of 2009's "la femme aux semelles de vent" on more textiles yet. The originality of this design stems from the arrangement of the textile swatches as flowers, their metamorphosis into delicate petals infusing a remarkable richness into this overall design. When tied, this scarf features glimpses into fabrics that, like a chest half-open, invites us to discover all the "secrets" hidden within. 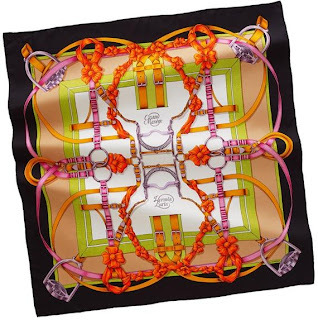 The pattern, when displayed, may not catch your attention on the spot when compared to the other "jewels" of this collection, but the tied scarf is excitingly youthful, and Hermes' many colour combinations is sure to appeal to even the more discriminate shoppers. 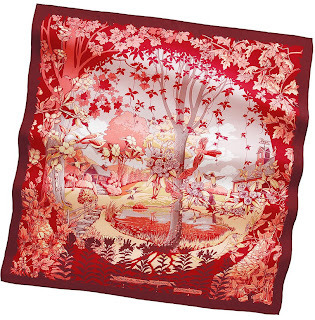 I caught wind of the upcoming scarf designs, so as we're waiting to admire - and feel - the actual scarves in the boutiques, I thought of paying hommage to the talented artist Christine Henry, whose newest creation will be featured as part of the Fall/Winter 2011 collection (this is in addition to the "Nuées imaginaires" - "Imaginary Clouds" - from earlier this year). This prolific artist is recognized for her intricate designs that reflect snapshots of both ordinary and extraordinary life, illustrated in a manner that makes you feel as if you hold an entire miniature universe in your palms (or wear around your neck, for that matter). Her "rives fertiles" ("fertile rivers"), included in Hermes' "water"-themed 2005 collection, caught my attention in a profound way, turning her into one of my favourite drawing artists. 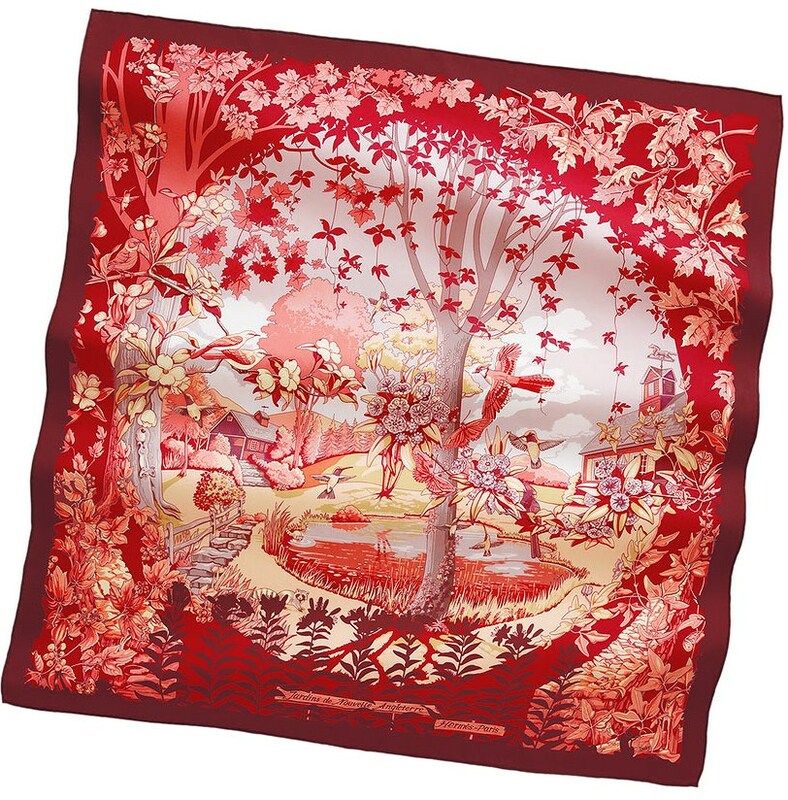 The fascinating aspect of her work, however, is that she succeeded in growing over the years, exploring various styles (as captured on the 17 designs of hers that Hermes has featured over the years) that appear quite disparate from one another. 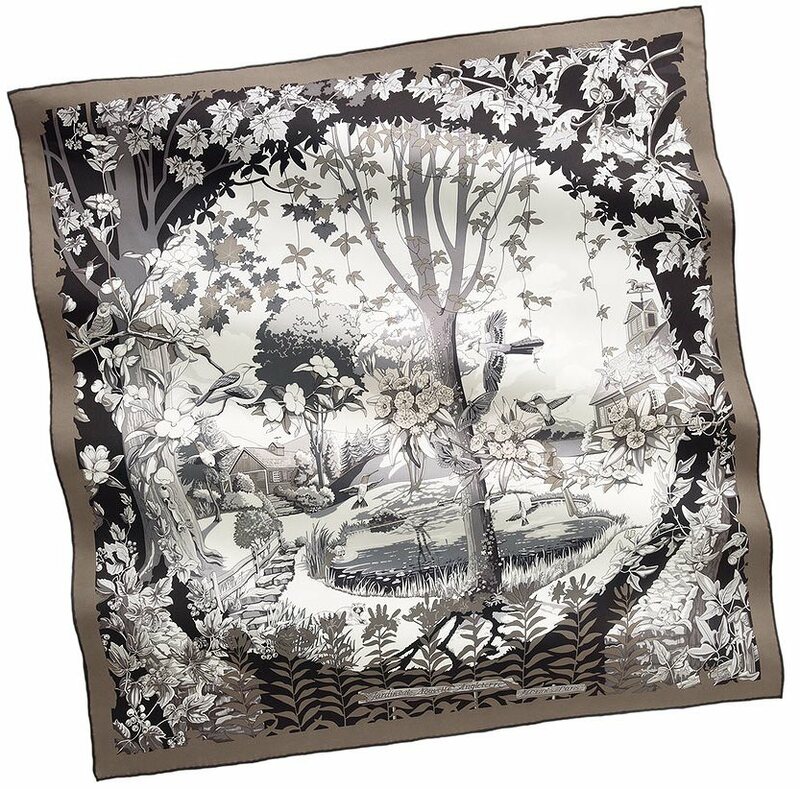 Today's "Chemins de garrigue" ("Paths of the shrubland") has been created in the same style - a style that infuses, in addition to dynamism, a tasteful richness and spectacular elegance into this scarf that only a handful of designs can boast. Because the scarf's "footprint" is a square, the shape itself is static. To compensate and infuse energy into a scarf, artists use specific techniques - "tricks" known only to craftsmen and women who've mastered the trade. One of the more obvious techniques consists of developing the designs along the square's diagonals. An alternative technique is Christine's approach to imagine curvy paths across the landscape, rather than straight lines. The winding paths take the explorer on a journey of discovery, inviting you to notice all the details along the way (as opposed to straight lines, where your sight is automatically drawn towards the point terminus of the "journey" and therefore presenting you with the risk of missing everything else surrounding the path). 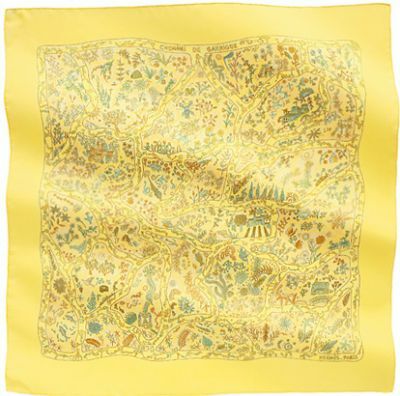 The inspiration behind this scarf springs from the calcareous plateaus of the Mediterranean shores - the "garrigue" - punctuated by dense thickets of kermes oak, juniper and stunted holm oak. Aromatic lime-tolerant shrubs such as lavender, sage, rosemary, wild thyme and Artemisia are common plants of the garrigue landscape. Calling this shrubland home are sheep, donkeys, rabbits, reptiles and snails alike - examples of which are graciously captured on canvas. 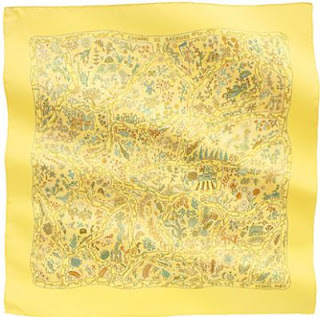 What's interesting is that Hermes' choice of colour combinations to illustrate this design - soft blue, soft pink, rich yellow and black, to name just a few - is very similar to "Nuées imaginaires" from Spring/Summer 2011. This scarf is not only beautiful, it is utterly elegant, promising a great many heads turning to admire both it and the person sporting it !